Having a website is the cheapest and easiest way to promote your business so why not to invest in your website? But there may be hundreds and thousands of businesses similar to yours so how do you compete with your competitors? Search Engine Optimization (SEO) helps to rank your website on search engines like google, bing etc. Create The Movement, is one of the best Tulsa search engine optimization (SEO) marketing agencies and a team of SEO experts. With little investment on SEO you can grow your business. Right SEO helps to rank your website where as wrong SEO is a disease to your website. Create The Movement has years of experience and knowledge that is resulting in healthy SEO. We are a Tulsa SEO service provider. We focus on giving you impressive results using SEO techniques that Google actually recommends. Get connected with our Tulsa SEO expert now! Let us give you the best search results for the keywords you want to rank for. Below we cover the basics of Search Engine Optimization and how it relates to ranking well within Google and other search engines. Find out with Create The Movement “Tulsa SEO” on how we can help your business grow online. A highly important part of Search Engine Optimization (SEO) and bringing consumers to your site is the use of keywords. To understand and know if you are using keywords in the most optimal way, you can do keyword research with various techniques that you can use to ensure that your website is getting recognized. As a Tulsa SEO Service provider and Tulsa SEO expert we always focus on keyword research. For an example “Tulsa SEO company” and “SEO company in Tulsa” both gives the same sense but technically in SEO one may be more sensitive and important compared to another. 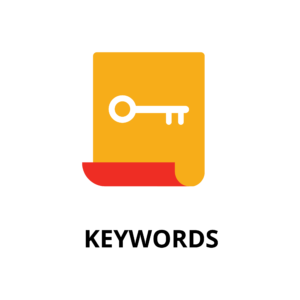 We use different techniques and tools while researching keywords for our customers. Because Google is where many people go to search for what they need, the keyword planner by AdWords is a great tool for companies who are searching for a better way to use keywords to effectively grab more consumer’s attention and to rank well on the Google search engine. What AdWords keyword planner does is provide businesses with the tools for understanding how different keywords will perform, helps them to brainstorm combinations, and provides them with estimates on how they can avoid using the same keywords they have used in AdWords before. We as Tulsa SEO provider can give your best result and guidance about AdWords. It helps to take the guesswork out of coming up with keywords to ensure success in ranking on search engines. Many times, companies come up with keywords that have little to no search volume which means that they are usually not recommended by search engines-specifically Google-due to how little they are ever used in search queries. For the most part, this means that companies should strive to use keywords that potential consumers use to find what they are looking for. These types of keywords tend to put company’s websites high in rankings and potentially bring more traffic your way. Yet, sometimes it is okay to use low volume keywords, when and if they are relevant to your service or product. Relevancy in keywords can be effective, even if search volume isn’t as high as other ones. One of the most important things to consider when choosing keywords for your website are your customers, the potential buyers of your product or service. When they are searching for what your company has to offer, they will probably use what are known as long-tail keywords to find what they want. If what you are after are buyers, it goes without saying that you should target that audience. Get in their minds and use the keywords that they would most likely use to find your service or product. While relevancy is a big theme in the world of search engine ranking, it is also a big deal when using keywords. Keywords that are relevant to what you have to offer will perform much better than keywords that don’t. Keywords are a big part of effective SEO, so it goes without saying that making sure they are relevant is an integral part of successful ranking. They should also be fluent and grammatically correct. While it can be challenging to come up with short, concise, and fluent keywords, ensuring that they effortlessly blend into your material while still making sense will go far in helping your text to be fluid and to help your website place at the top on search engines. 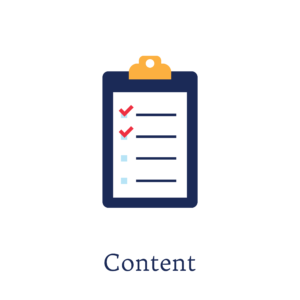 Content strategy is a very broad topic as SEO revolves around what is written and the text typically revolves around SEO and local SEO practices, making what you write a highly important part of a website. Following are some details to keep in mind when it comes to your website’s material. We, as an experienced Tulsa SEO Company also offer content marketing services to our clients. Many companies neglect to pay attention to their competitors’ texts and focus solely on what they believe the target audience is looking for. While the potential buyers shouldn’t be ignored, to ensure that your material is on point, you should take stock in what your competitors are putting out. What type of posts or text do they have? Is it pure informational text for purposes of having a website or do they also have blog posts or links to their social media sites? How much do they have written? Do they have a website with lengthy material, or several different websites with text, or posts on various platforms? What topics do they touch on? Discover what topics they touch on and their relevance to what your companies offer. Do they do a good job at getting people interested in what they have to offer through what is written? After you have done some research, determine how you can match their text and do even better. If you notice ways where they could have done better in grabbing buyers’ attention, do better, and write better text. If you see that they expressed some valid points in what they have posted on their website, do that and then some. The point of understanding and researching competitor’s websites is to provide your potential buyers with the reasons why they would want to choose you over them. Of course, in the attempt to do better than your competitors, don’t steal their work. Having your own unique text is highly important in not only impressing buyers or clients, but also in ranking high on search engines, which is the goal you are ultimately striving for. Plagiarized text, cliché writing, and posts that have poor keyword usage are all negatives when it comes to websites, so when posting any type of text on your website, you will want to pay close attention and take time to create the most unique and effective written work possible. • Duplicate posts that haven’t been proven to be used intentionally, such as using a post from another website to make a point on your own, could cause your ranking to drop. The whole point of content strategy – apart from providing your audience with relevant information-is for you to rank high on search engines so that more potential customers can find you and take note of what you have to offer. This is why your written work is so important, as it greatly affects rankings and makes a huge difference in getting noticed. But, how? Relevant information ranks high. Text with topics relative to what your company does will help your website to rank high on search engines. Repetitive text ranks low. Repetitive text with too much fluff won’t do much for your rankings. Clear and concise (readable) content ranks high. Easy-to-read text can not only make it easy for your audience to want to use your service or product, but it also helps to put your website high on search engine rankings. The first few paragraphs of your text can make or break your website. Your text should be descriptive and relevant within the first few paragraphs, both for your potential buyers to understand what you are about and for higher rankings. Correct spelling and good grammar matter. For the most part, poor spelling and incorrect grammar can negatively affect your rankings and it also does nothing for gaining the trust and respect of buyers and consumers. A problem that some companies may have when it comes to their posts or text is by having irrelevant text written in such a way that is not conducive to easy reading. Online browsers who are searching for a service or product are not interested in reading pages and pages of text to find a couple of sentences of valid information, so when writing text for their website, companies should remember that everything written should provide potential customers with quality information and relevant text. While the text on your website is extremely important, another key factor of ranking well is to ensure that the experience that your users have and the navigation makes it easy to maneuver. You can have the best material and most effective keywords around, but if your Tulsa website is messy and is difficult to navigate, the amount of visitors will drop, as will your rankings. The experience of the users is about how easy it is for your potential buyers to find the information that they are looking for. If they want to read about your services, but your service page is impossible to find, this isn’t going to help you rank high. Search engines won’t allow your website to rank high if the website is messy and unattractive. Page speed. There can be nothing more frustrating for a web browser than to come across a website that promises you the information that you are looking for, but that goes so slow, you lost all interest before finding what you are looking for. Page speed is extremely important for an optimal experience and can mean the difference between getting new buyers and clients or not. Solid colors. A website which contains too much color, splashes of color all over, or that has messy images and format will distract the viewer from the relevant information that they are looking for. This is why it is important to use solid blocks of color on your website that while adding aesthetics that don’t distract from the text. White space. Some web designers may dislike white space thinking that it makes it look like their website isn’t fully completed, but white space can be your friend. It makes the text easy to read, it doesn’t distract from the text, and is in fact, attractive on many websites. Use bullets in your written material. It can be difficult to read big blocks of text, but some writers tend to forget this by forcing lists and information into large paragraphs. While what they are saying may make perfect sense, viewers may not even take the time to read it. Breaking up text and information by using bullet points helps the material to appear shorter and allows readers to find the information they want to read, much more quickly. Use attractive images or buttons for calls-to-action and links. Any time that you want a user to take some type of action or visit another link or page on your site, it helps it to be a better navigational experience for them when you use attractive buttons for that text or link. 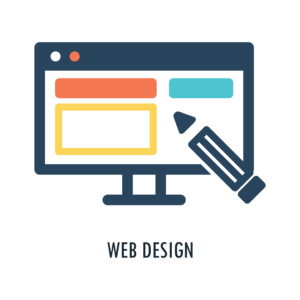 How your website looks is an integral part of the experience. It’s part of what makes it easy for viewers to get around your website and to find what they are looking for. The two components go hand-in-hand in providing your potential buyers with the information they need in an easy-to-navigate and understand format while also helping your site to rank high on search engines. Google, for example, takes on-page optimization-including the navigating experience and website appearance into account when ranking your website, so it behooves your company to keep this in mind. Quality SEO can mean that you get more customers than you ever had before and that your company grows by leaps and bounds. 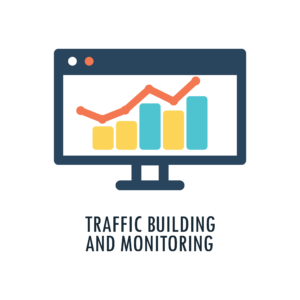 This is where more visitors to your website can bring you return on investment. Investing in quality SEO and text is something that many companies are doing in an effort to be seen and noticed more. The problem with this is when a company puts a lot of money into ads or posts and SEO, but doesn’t invest in quality or relevant information. While there may be plenty of online browsers and shoppers coming your way, if the SEO or text is irrelevant to what you have to offer, you may be receiving viewers that are in fact, not at all interested in what you have to offer. The way to ensure that visitors to your website will bring you a return on investment is to ensure that your material and SEO techniques are relevant and effective, so that the people that visit your website are potential buyers who are interested in your product or service. When it comes to ranking, while some companies may not mind ranking on a national or international level, some companies are hoping to rank locally. While a restaurant may like the attention and views garnered on a national level online, what they really need is to rank high locally so that they can receive more guests and sell more meals. This is where using services such as Google My Business come in. When you complete a business profile on Google My Business, your website will appear on Google Maps. 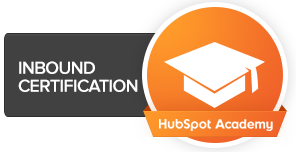 This is important for helping you rank high and for more customers to find you. When someone searches for something that has to do with your service, your business will appear, especially if you have relevant material on your website. Why has linking become such an important part of effective SEO and high rankings on search engines? While some companies tend to focus entirely on external linking, linking both internally and externally is key in achieving a high ranking. External linking is when a website links to other websites which contain relevant text. For example, if you have a blog post on your site about something pertaining to information that can be explained in-depth elsewhere, a link to a comprehensive site can greatly enhance your chances at higher rankings. What we as a Tulsa SEO company say is “internal linking is important for your rankings”. The only thing about internal linking is that instead of linking to other websites, you are providing links to other pages on your own site. Not only does this help your rankings, but it also helps users navigate your website in a more simple and straightforward way. 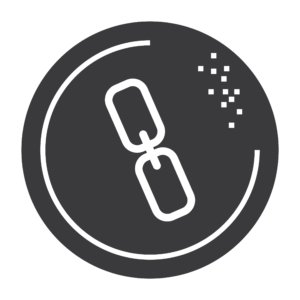 Internal links also help you to be more reliable and trustworthy in the opinion of users, which helps to provide you with the authority you need to rank higher on search engines. When working on your SEO for your website, it is important to keep in mind that you need external and internal links for the most optimal results. Having backlinks on your website makes a big difference in rankings and should be high on your list of SEO priorities. Basically, on-page optimization is what you are doing when you combine all of the above factors in order to achieve high rankings with your technical SEO. From meta descriptions to tags, design, and text, on-page optimization is making sure that all of the components on your website are up to par with what Google expects. The point of SEO and all the techniques mentioned here is to achieve high rankings on search engines. Higher ranking means more visitors to your website and more visitors to your website means more potential buyers. Your tags have keywords in them. As you can see, all these factors come together to provide users with an easy and pleasant experience while visiting a website. To truly achieve high rankings on search engines, a website can’t only have one component while ignoring all the others. A website is the public image that the world can see-which is the point of SEO so putting your best foot forward in all the SEO techniques and practices is key to achieving the end goal of more visitors, ranking high on search engines, and getting more clients and buyers. Why do all these things matter to Google? For some people, all these components and factors that Google requires for high ranking may seem to be annoying and time consuming and as if Google just wants to make it difficult for companies to be good. The truth is that while it may seem like having the relevant keywords or having great tags and headings are simple details, Google wants to put the best forward, because after all that is what users want as well. If Google allowed any website to get high rankings for any reason, then there would be plenty of difficult-to-navigate and irrelevant websites at the top while the poor consumer would end up frustrated with their search. Google will put your page on top when it has the SEO optimization that it deems worthy. That is why it is so important to have a quality website and well-planned SEO. When you convince Google that you have what it takes, then you can be sure that you will get the ranking you want and the traffic you need. Need help from a Tulsa SEO Company and Tulsa SEO experts? While all this information may seem overwhelming at first glance, once you understand the importance of Search Engine Optimization (SEO) and how text, appearance, keywords, and user experience combine to help your website place high in search engine rankings, it will be easier to create a winning website that will bring you a larger amount of visitors, a better ROI, and the consumers that you want. If you are looking for help for your website and want professionals to provide you with SEO services, contact Tulsa SEO expert using the form below. 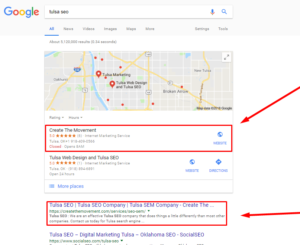 We have the experience, knowledge, and professionalism at Create the Movement ” Tulsa SEO Company” that can help you rank high on search engines.